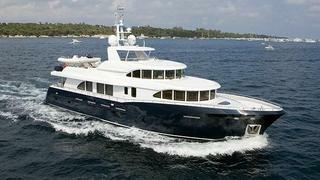 Mark Seaton at Yacht & Villa International in France tells me he's signed the 27.4m motor yacht Belle Isle for sale. Built to Lloyds class and MCA compliant at China's Kingship yard in 2010, this steel and aluminium full displacement yacht was designed by Vripack with oceangoing capabilities and a long range. Accommodation is for eight guests in four staterooms and she's fitted with zero speed stabilisers. With a range of 4,000 nautical miles at 8 knots, Belle Isle is asking €6.2 million.